Body Lotions almost always contain a form of alcohol in the list of ingredients. Even in all-natural cosmetics alcohol is used as a preservative or to stabilize the formula. However, alcohols are not always bad. In this article we have put together body lotions without alcohol that are suitable for sensitive skin. When we talk about the effects of alcohol you primarily may think of alcohol that is drying the skin. But there is a distinction between short chain alcohols which cause drying and long chain fatty alcohols whose major purpose is to keep the water and oil emulsion together. Short chain alcohol names are often shortened by using the suffix –ol, such as isopropanol and ethanol. 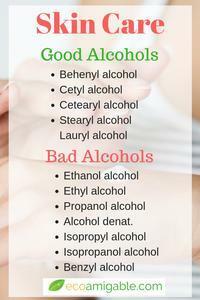 Isopropanol is rubbing alcohol, ethanol is the type of alcohol you find in alcoholic drinks. 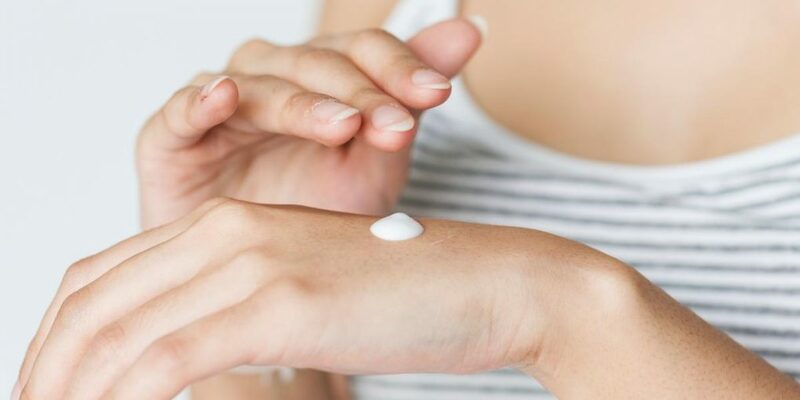 In skin care isopropyl and ethyl alcohol are commonly used and act as a preservative or as a solvent for other ingredients in the product, e.g. in hand sanitizers. They are labeled as Isopropyl Alcohol, Ethyl Alcohol or Alcohol Denat. Products with short chain alcohols may cause the skin to become dehydrated. The small size of these short chain alcohols allow them to penetrate more deeply into the skin which has a drying effect on the skin. Especially if you are suffering from Rosacea, avoiding short chain alcohols is very important, as they are common triggers for the condition. On the other hand the long chain alcohols are very different. They are also called fatty alcohols. They are waxy solids instead of liquids and are often derived from natural oils such as coconut or palm oil. On the INCI list you can spot them as cetyl alcohol, behenyl alcohol, stearyl alcohol, or cetearyl alcohol. Fatty alcohols are skin emollients and are non-toxic. They do actually condition and soften the skin instead of drying them! Many products are called “alcohol free”, but what matters is what type of alcohol they are free of. We have put together some Body lotions without the bad alcohols. The body lotions from Bloom Skin Care from Wisconsin are free of harsh chemicals. They do not contain Parabens, propylene glycol or alcohols. They use deep moisturizing macadamia, pistachio, and jojoba oils combined with the powerful properties of honey their our own Wisconsin wildflower honey. Puracy from Austin Texas use plant-derived ingredients in their body lotions. Their Organic Hand & Body Lotion is based on Shea Butter and contains plant-derived Cetyl Alcohol, which – as we have learned earlier – is a fatty alcohol that actually smoothens the skin. The lotion is hypoallergenic, fragrance free and can be applied to all skin types. Legend’s from Rhode Island provide a handmade body lotion made with goat mild. It is alcohol free and is free of harmful ingredients such as Parabens, Formaldehyde, Phosphates or Mineral oil. It is especially formulated for sensitive skin and is fragrance free. When searching for a body lotion without alcohol you have to understand the difference between short and long chain alcohols. Whereas short chain alcohols may dry the skin; long chain fatty alcohols help to sustain the structure of the product and can even soothe your skin.